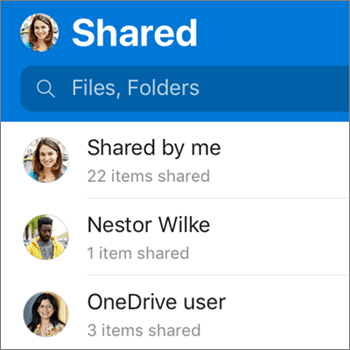 You can share OneDrive files, photos, and folders from the OneDrive app on your iOS device just as you can on a PC or Mac. You can also see Files shared with you. To stop sharing, go to the OneDrive website and sign in with your Microsoft account, or with your work or school account. Select the file or folder you want to share (press and hold to select it). Tap Share > Copy link. OneDrive creates a URL for your files and puts it in your device clipboard. Go to where you want to put the link, such as a blog, web page or social media post, and paste. In the Invite People panel, at Share with, enter the email addresses you want. Tap Add Contact to add recipients from your Contacts list. If you want the recipients to be able to add changes or edits, under Options, turn on the Allow editing? switch. Turn it off to make the file read-only for the recipients. Tap Add. The recipients get an email message with a link to the document. Tap Share > Email in Outlook. 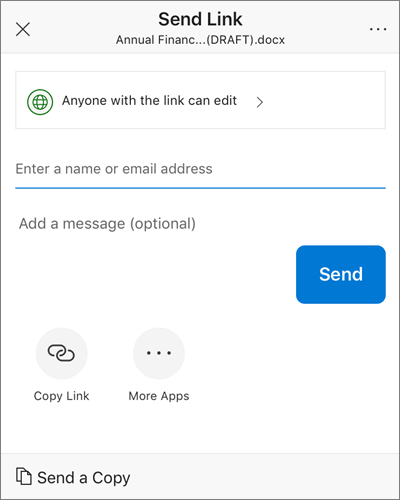 If you don't have Outlook for iOS on your device, tap Share > Mail, then use the iOS mail app, or choose the app you want to use. An email message opens, including a link to the files you're sharing. Enter the address of the people you want to share with, and add a note if you want, then send the message. Tap Share > Send file. Tip: Sharing as an attachment works only with individual files. If you want to share multiple files or a folder, use Invite people or Copy link. Select the app you want to use for the email message. An email message opens, with the file you're sharing as an attachment. Enter the address of the people you want to share with, and add a note if you want, then send the message.